You've done everything you can to make your current job work, but it is not working. Whatever your reasons for why you can't make your current employment succeed for you, it may be time to listen to your heart. You may find that it's time to quit your job. Many situations at work are difficult, if not impossible, to solve, and you need to look out for your best interests. Staying in a bad situation can break your spirit and kill your soul if you stay in it for too long. You'll make yourself miserable and possibly become the negative employee everyone avoids. 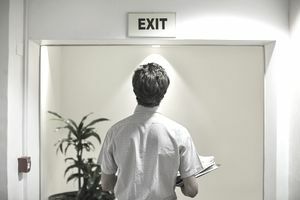 While quitting a job is never a decision that should be taken lightly or made on the spur of the moment, there are reasons why it might be the best option. Consider if that applies to your situation, and, if possible, have another opportunity lined up before you leave your current situation. Many problems can be solved with better communication or more challenging opportunities at your current place of employment. That's not always the case, though. Sometimes, it's just not working out, and these 10 situations are good examples of when that might be the case. Your company is experiencing a downward spiral, losing customers, losing money, and rumors of possible closure, bankruptcy, and failure prevail. Working every day is like waiting for the other shoe to drop. Senior company leaders are meeting behind closed doors. Employees are all fearful, looking for new jobs, and the general environment is stagnant and provoking anxiety. Your relationship with your manager is broken or damaged beyond repair. You have sought help to mend the relationship, but you know it is beyond recovery. Whatever the reason, you need to take a hard look, maybe even talk to your manager about the situation. But, chances are, it’s time to quit your job and move on. Your life situation has changed. Perhaps you have married or had a baby and the salary and benefits no longer support your life needs. You need to move on to better opportunities to support your family. Do this without regret after identifying that there are no new opportunities with your current employer that might change the situation. Your values are at odds with the corporate culture. Perhaps your company is egalitarian and you believe in assigned parking spots for salaried employees. Your company does annual employee satisfaction surveys and you think these are a waste of time. Your company is hierarchical and you want to influence every aspect of your job. No matter where the clash is occurring, a lack of congruence with the corporate culture will destroy your attitude at work. Leave quickly once you identify this culture clash. The situation will not improve, and sticking around may make you hate work. You've stopped having fun and enjoying your job. No matter what changed in your workplace, when you dread going to work in the morning, it's time to leave your job. Just do some inner thinking about whether you are frequently resistant to change. It may not be the job itself if you have a long-term pattern. Your company is ethically challenged. Perhaps the managers lie to customers about the quality of the products or the days on which products will ship. You become aware that the company is stealing information from competitors. Whatever the issue, don't stay in an organization where your ethics are out of sync. Leave as quickly as you can if you have no way to influence more ethical behavior. For whatever reason, you have behaved in ways that are considered improper at work. You've missed too many days of work, slacked off on the job, failed to maintain needed skills and just generally developed the reputation of a loser or a slacker. That reputation, once earned, is unlikely to change, so you might as well move on while you have the opportunity. You've burned your bridges with your coworkers. Your group is not getting along in an environment that requires people to work together well. Again, at some point, the reasons don't matter; start fresh in a new job and resolve to not let this situation happen again. Especially if your efforts to resolve the situation have been unsuccessful, it’s time to move on. Your stress level is so high at work that it is affecting your physical or mental health and your relationships with your friends and family. Watch for the signs of burnout, and if they can't be cured, move on. You are unchallenged, need more responsibility, and want to seek opportunities that just don't exist for you in your current organization. You've explored the current and potential options, and they are limited. You may be ready to quit your job when there are no opportunities waiting. Do You Need a New Job or Is a Whole New Career in Order?